View More In Travel Gear. Does it seem to you that it's not possible to keep the upholstery of your car nice when you have small children? Does your child's car seat constantly leave dirt and marks on the seat of your car that are impossible to remove? Need some storage space to put your child's toys handy? The Lebogner Car Seat Protector + Kick Mat With Pockets is the answer!!! 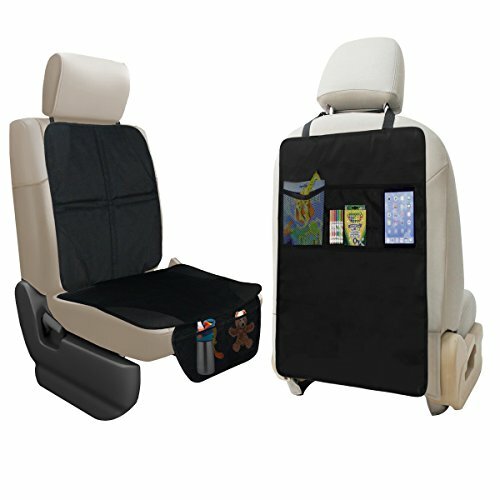 ★ Customized design fits the entire back seat of Most Vehicles. Measuring 19" Wide x 27" Long. ★ They fasten to the back of your seat with two attachment points at the top and bottom for a secure fit. ★ Water-resistant, machine-washable fabric for easy care. ★ 3 organizer pockets on the front for handy storage of food or kids play toys. ★ Protect the back of your vehicle seats from dirt and liquids. Order Includes 1 Car Seat Protector And 1 Kick Mat. ✓ Our Car Seat Protector Is Made Out Of Durable Material To A Very High Standard Which Gives The Car Seat Protector A Super Long Life. Easy To Wipe Clean. Simple And Easy To Install With The One Piece Design, And No Worry To Keep Track On Spare Parts. ✓ Our Car Seat Protector is designed with super grip vinyl corners to prevent your baby's forward or rear facing car seat from slipping, And super anti slip backing to prevent the car seat protector from slipping on your leather or cloth seat, Which makes sure your baby is safe at all times even with smooth slippery leather car seats. ✓ Our Kick Mat Measures 19" wide x 27" long, Has double layered fabric that will keep your Car Seats Clean even with the most active little feet in your car seat. And will instantly protect your upholstery or leather car seats from Scuff Marks, Moisture, and Dirty Footprints. The Kick Mats are water resistant, machine washable, or easy wipes clean that will give your Kick Mats a Super Long Life and Always Look Good. ✓ Buy It Now With Confidence, This Best ★ TOP QUALITY CAR SEAT AND KICK MAT PROTECTORS ★ Will Keep Your Seats Clean 100% and We Guarantee Satisfaction With a 100% Lifetime Money Back Guarantee. If you have any questions about this product by lebogner, contact us by completing and submitting the form below. If you are looking for a specif part number, please include it with your message.